Sunscreen shouldn’t weigh down your skin—nor the earth. If you wouldn’t want your skin to absorb harsh chemical sunscreen, you wouldn’t want the ground to absorb them either! We’re proud to provide several types of biodegradable sunscreen that will help protect your radiant glow without contributing to environmental pollution. 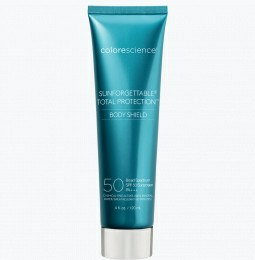 What’s The Best Sunscreen If I’m Going To Be Outside All Day? Many people have great intentions and are on top of their initial sunscreen application, but then forget to reapply it after spending some time in the sun. Dermatologists agree that sunscreen should be reapplied every two hours, so don’t make this mistake! Reapplication should be even more frequent if you have contact with water or sweat, so it’s important to have easy-to-apply, biodegradable sunblock with you at all times. That’s one of the many reasons Colorescience mineral face powders are changing the game when it comes to SPF protection. 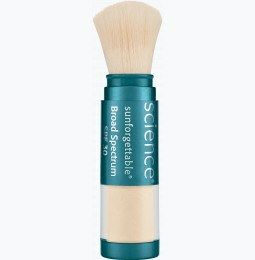 Application is effortless; simply brush on the mineral powder and you’re set with SPF—no mess, no stress! 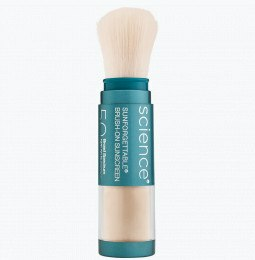 Conveniently pocket-sized, easily pop our brush-on SPF into your purse or beach bag; since it’s biodegradable sunscreen, you don’t need to worry about polluting the ocean with your sun protection. It can be worn alone or over your setting powder makeup, and even the kids won’t fuss when you apply this ultra-soft powder. The ability to easily reapply makes our biodegradable sunblock perfect for those who know they’re going to be out in the elements from sun-up ‘til sundown. Do Your Sunscreens Contain Harmful Chemicals? Colorescience’s biodegradable sunscreen provides defense against environmental stressors while keeping the world around you safe; when you wear our products, you’ll never need to worry about contaminating the earth with parabens or the ocean with oxybenzone. Our entire line of products is chemical-free and eco-friendly. Whether you want lip gloss for sensitive lips or the best biodegradable sunscreen, we have you covered. Our revolutionary brush-on formula offers something for everyone. With SPF 30 and 50 options, you can find the solution catered to your skin. 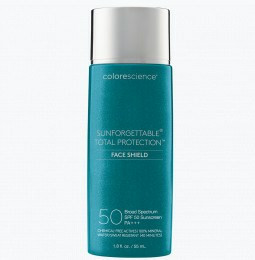 For people who prefer the more traditional feel of a liquid sunscreen, we offer Colorescience Daily UV Protector. A lightweight, “whipped” mineral formula, this blurs imperfections without a greasy feel for the perfect everyday makeup look. Awesome - Always looks natural. 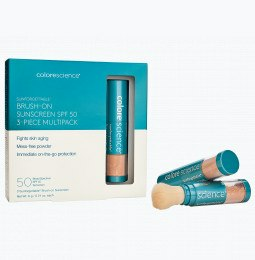 sheer to full coverage, last all day and doubles as a concealer. Transfer resistant and always looks natural. I love how easy this is to apply. I keep one in my purse and apply it every time I am in the car. I keep one in my beach bag, and my daughter puts it on every time she goes swimming. My boys even apply it on their way to baseball games. It goes on easy, even over the eyes and ears. I have never burned with this product. I use it on my face, chest and shoulders (and sometime my legs too!) It lasts a long time, too. Honestly, this stuff is amazing -goes on easily, is super light and either size travels well! You can reapply as necessary without any greasy feeling on your hands or body afterwards! So nice to not have to worry about clean after applying! Whether you’ve smelt the pungent chemicals first-hand in an overcrowded beach bathroom, or you’ve just caught wind of the rumors surrounding spray sunscreen, the dangers of aerosol spray are finally starting to get the attention they deserve. It might seem counter-intuitive; if you’re applying spray sunscreen to protect your skin, how can it simultaneously be dangerous? Lathering on a substantial layer of sunscreen has probably become a part of your usual morning routine. As we all know, harmful UV rays can accelerate signs of aging and increase the risk of developing skin cancer. But what about the air pollution we encounter on a daily basis? Does that affect the health of your skin?